There was a time when the Toyota Tacoma mid-size pickup had only one rival, the Nissan Frontier. Now there are Canyons and Colorados and even a new Ranger—but the 2019 Tacoma still draws a crowd with its off-road capability, safety technology and resale value. The 2019 Tacoma comes as an extended cab or as the more popular crew cab, which has more comfortable seating for up to five passengers. Extended cabs have a 6-foot bed; a 5-foot bed is standard with crew cabs, though the 6-foot bed is an option. The Tacoma is rated to tow up to 6,800 pounds when properly equipped, which is good for a mid-size pickup. The base engine is a 2.7-liter 4-cylinder with 159 horsepower, but most models have a 3.5-liter V-6 with 278 horsepower and strong acceleration. Both engines are available with either a 6-speed manual or 6-speed automatic transmission. Rear-wheel drive is standard, but four-wheel drive is available on most models, and the only drivetrain on some. The 4-cylinder engine gets EPA ratings of 20 mpg city, 23 highway, and 21 combined, compared to the V-6 engine’s 19/24/21 mpg with the 6-speed automatic. Combined EPA figures fall 1 mpg with four-wheel drive, and another mile per gallon with the 6-speed manual. Standard safety equipment includes automatic emergency braking with pedestrian detection, adaptive cruise control and lane departure warning, which isn’t available at all on some rivals. The NHTSA gives the Tacoma crew cab four stars overall. The 2019 Toyota Tacoma lineup Tacoma includes the SR, SR5, TRD Sport, TRD Off Road, Limited, and TRD Pro. The work-edition SR costs about $25,000, and doesn’t offer many features beyond its safety technology and a 6.1-inch touchscreen for infotainment. On the extended cab, even rear seats are an option. The SR5 costs about $28,500 as a crew cab with short 5-foot bed. It adds power features, upgraded interior trim, a chrome rear bumper, and other features—including the base 4-cylinder and rear-wheel drive. Choosing the V-6 raises the price to about $32,000, and adding four-wheel drive knocks it up another $2,700. The Tacoma Limited costs about $40,500 and features leather upholstery, dual-zone automatic climate control, blind-spot monitors (optional on the other models) and 18-inch alloy wheels. About $36,500 will get you a TRD Off Road, with standard alloy wheels, keyless ignition, a 7.0-inch touchscreen for infotainment with navigation, a locking rear differential, and some off-road bits. The $43,000 TRD Pro has Fox shocks, all-terrain tires, and thick skid plates. Even in the crowd of mid-size trucks, the Tacoma stands out, with its tall front end and stance. The headlamps sweep back into wide fenders with aggressive flares that are either body-colored or a rugged gray. There’s a kick over the rear glass that marks it as a Tacoma, along with the stamp on the tailgate. The upright styling carries into the cabin with a car-like instrument panel. The touchscreen sits high, over climate control knobs and a row of switches. The interior feels functional and sturdy, while the textures, colors and contrasting stitching are attractive. The extended cab has rear-hinged back doors that open to a bench seat that’s better for packages than people. Crew cabs have four doors and a real back seat, but the seat is upright and leg room is limited. The 2.7-liter 4-cylinder engine has 159 horsepower and has more than 4,000 pounds to carry around; acceleration is moderate at best. The 3.5-liter V-6 has 278 horsepower, and it’s much more energetic—and delivers the same fuel economy as the 4-cylinder. Most V-6 Tacomas come standard with a 6-speed manual transmission whose long throws are a constant reminder to the driver that he or she is behind the wheel of a truck. We like it. The optional 6-speed automatic is smooth, and upshifts eagerly in the name of fuel economy. The Tacoma is built on a ladder frame with a solid rear axle using leaf springs, and an independent front suspension. It rides firmly no matter which model you choose. The Fox shocks on the TRD Pro are very stiff, although surprisingly, they absorb big bumps well. The available four-wheel-drive system works using a simple knob, but there’s no full-time four-wheel-drive mode for use on dry pavement. The TRD Off Road or TRD Pro have a more complete four-wheel-drive system, including a locking rear differential, a crawl control system that carries the truck along at walking speeds, hill-descent control, and five off-road traction control modes. 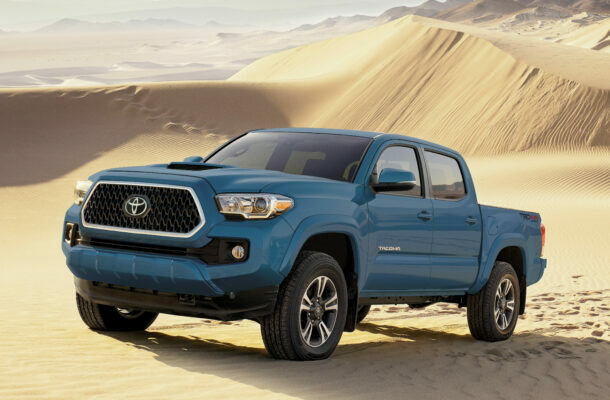 The 2019 Toyota Tacoma earns most of its attention with its off-road talent. It has such a strong following, “Taco” fans look past its rougher ride and its price tag. It’s tough to find a truck with as many off-pavement bona fides, though. Just make sure to stick with the V-6 and four-wheel drive.